Kleanthi Lakiotaki is a post-doc researcher in Computer Science Department of University of Crete, working on the development of data analysis algorithms and methods, with a focus on developing specialized packages and tools for analyzing mass cytometry data. 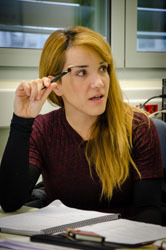 Formerly, she worked on the development of an electronic Molecular Diagnostics Assistant, within Bioinformatics Laboratory, at Institute of Computer Science-Foundation for Research and Technology Hellas (FORTH). She studied Physics at the University of Crete with majoring in Atomic Molecular Physics and she also completed an MRes course at the same University. During her studies there, she was an undergraduate and postgraduate fellow at FORTH. She has also been a Marie Curie research fellow at Imperial College London. She holds a PhD degree in Information and Decision Sciences from University Paris Dauphine and Technical University of Crete, under joint supervision. She has been author or co-author of 26 journal articles, book sections and peer reviewed conference articles. She has been teaching at university level courses such as Business Intelligence and Knowledge Management, E-business, Object Oriented Programming, Decision Support Systems and Statistics. Her research interests include Bioinformatics, Recommender Systems, Data Mining and Machine Learning.